Come visit our newsgroup for the latest info. Excellence Barbuda Day Tour - Discover the secrets of our islands in the luxury of Excellence Step aboard this sleek state of the art power cat for a day trip to our sister isle Barbuda. Visit the famous frigate bird sanctuary, walk along pink sand beaches and snorkel over untouched reefs. Excellence Circumnav Eco Adventure - Discover the secrets of our islands in the luxury of Excellence Cruise around Antigua on this sleek power cat in comfort and speed. Visit the North Sound of Antigua, lunch at deserted Green Island, view the rugged east coast and the white sand beaches around the island. Enjoy spectacular picture opportunities of Devil's Bridge, Nelson's Dockyard, the Pillars of Hercules and more. Tiami Catamaran Cruises - Pure sailing in an uncrowded atmosphere. We invite you to experience the best Antigua has to offer aboard the Tiami Catamaran. Once aboard our custom built catamaran chances are you will have the best day of your holiday. Choose from our Cades Reef Snorkeling tour, The Bird Island Sail Away or charter the boat for yourself. Tiami never sails with large crowds guaranteeing you pure sailing in an uncrowded atmosphere. By day or by night the Jolly Roger can be an exciting adventure for all those daring souls. 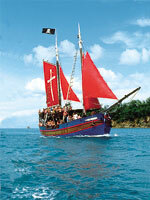 Choose from one our pirate cruises for a fun filled day or night of activities and dancing. 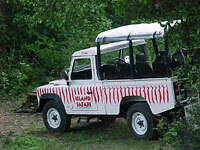 Step into one our safari rigged Land Rover 4x4's and enjoy the most fun filled adventure tour of the island. Let our drivers take you where no tour bus will to explore our beautiful island. Imagine a tropical island where the only way to explore is by Land Rover and Kayak. Island Safari will take you through Antigua's scenic countryside. Next you will kayak through the peaceful and untouched mangroves of the north sound viewing star fish, upside down jelly fish and many more of natures treasures. After kayaking its off to secluded Bird Island for lunch, swimming and hiking. This is an out door experience that is educational and fun! 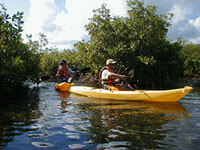 Get up close and personal with nature on this fun and educational kayak tour. End the day with a trip to famous Bird Island for a hike and swim.